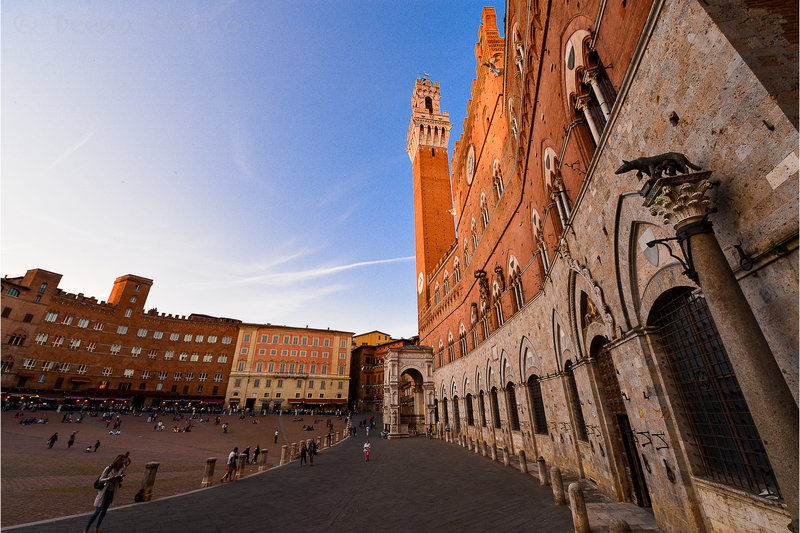 Siena is by far one of the most enchanting medieval cities we have ever visited. It is spectacular and charming and is nestled in the heart of Tuscany. I know I’ve said it before and I’m sure I’ll say it again, but the most advantageous way to explore a gem like this one is on foot for hours, over several days. 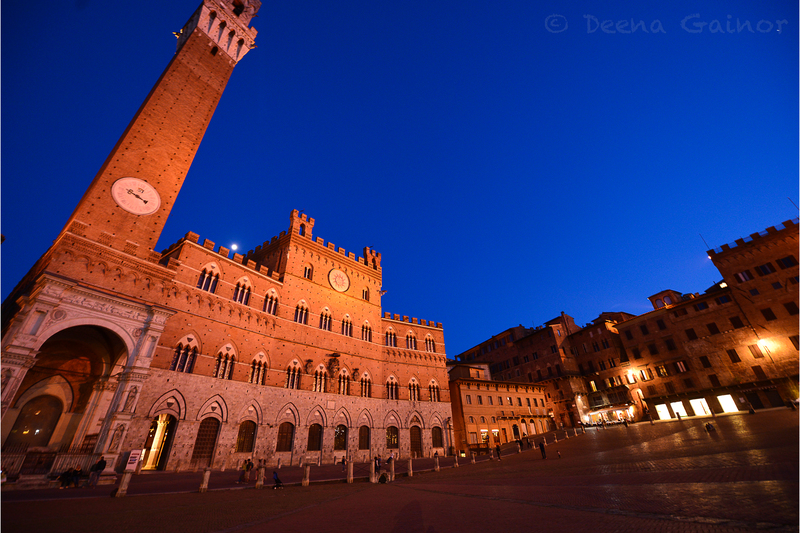 Yes, Siena can definitely be seen and enjoyed in one day. It’s a relatively easy day trip from Florence. Once you realize how special it is, however, I’m guessing you’ll want to spend more time discovering its hidden nooks, meandering through it’s narrow, cobblestoned streets, and sampling some of the best Gelato in Italy. Here is my favorite spot in all of Siena, the central Piazza del Campo. Il Campo is legendary for its historical Palio horse races and intense, ancient rivalry between competitors. It is also, in my opinion, the heart of Siena, and a gathering place for all of its citizens, both in ancient times and today. We spent a lot of time playing, chatting, and people watching here while leisurely enjoying a little cappuccino and gelato. Our favorite time of day was early evening when people seemed to gather for the sheer joy of just being together. Cafes and restaurants lining the Piazza filled quickly, laughter and impassioned conversations permeating the cooling night air. Though Siena may seem like a quiet village, Il Campo comes alive at night, with friends and neighbors hopping from one restaurant or cafe to another, laughing, strolling, and divulging personal details of their day. Tourists, students, and residents alike stop to watch street performers sing, play a musical instrument, or entertain them in an even more creative way. 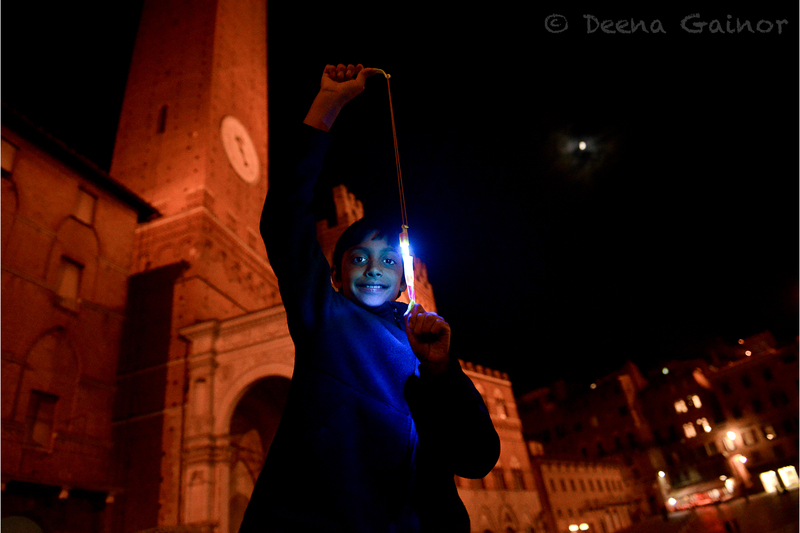 Hawkers dazzle little children with their light up rockets. Danny loved this one (see photo above)! If you execute your launch just right, the brightly lit rocket soars into the darkening sky, almost disappearing before it plummets back down. I won’t lie and say he (or dad) got it the very first or second time, but eventually, they mastered the launch and we were all quite impressed! Our visits happened to fall on gorgeous May evenings, so the already captivating setting was even more alluring. 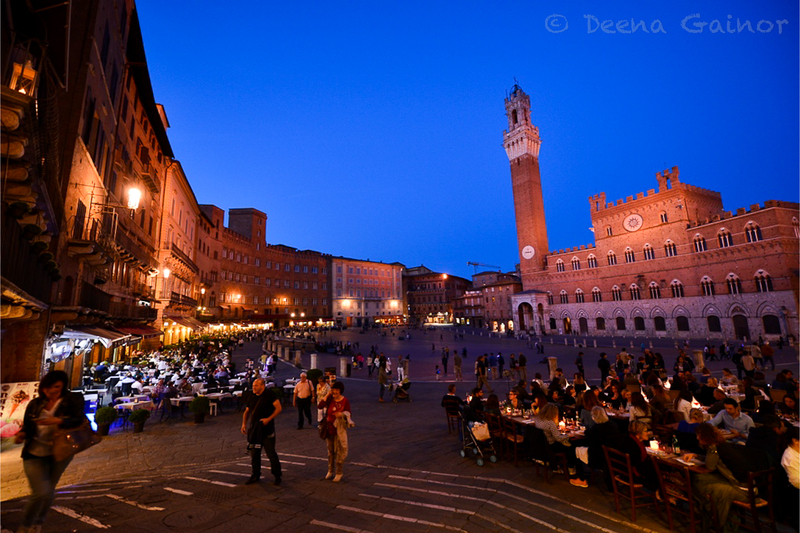 I could imagine spending many more evenings fully appreciating all that Siena and the Piazza del Campo had to offer. And by now, it’s no surprise that we ended many nights in Siena with Gelato! This photo is from Danny’s 10th birthday. 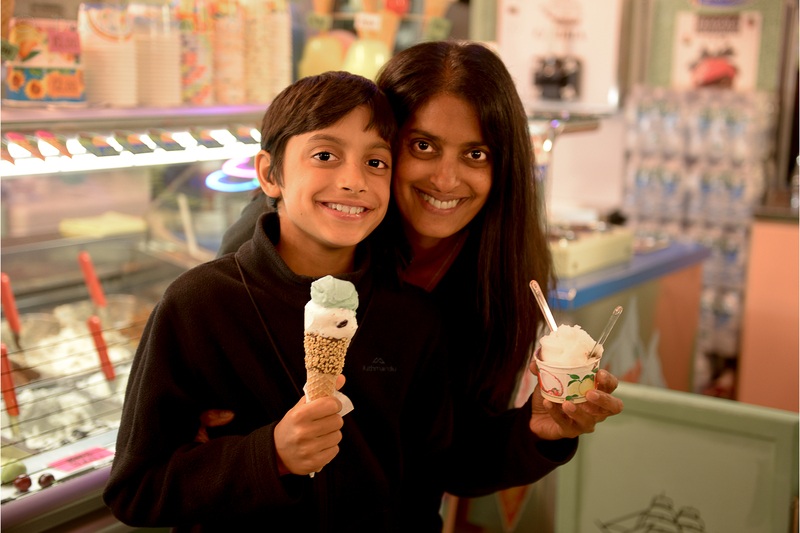 Hmmm…his Gelato seems a bit bigger than mine! What do you think? Just a few more snapshots of this beautiful city. And if you haven’t already surmised, Siena, in my opinion, is a MUST SEE destination if you’re anywhere near the vicinity of Florence. Seriously, it is worth the time and effort it takes to get here. But by all means, don’t take my word for it. Come determine this truth on your own and let me know what you think. I’d love to know!